7/10/07 - Avon Protection Systems Inc. in Cadillac, Michigan is a U.S. subsidiary of Avon Rubber PLC in the UK, which has been around for over 120 years. Avon has been in the respirator/gas mask business since the 1920's, so they've quite a bit of experience under their belt, to say the least. Avon is widely regarded as a market leader in the manufacture and design of NBC (Nuclear, Biological and Chemical) respirators for the military, special forces, police and civil defense sectors. Most readers to this site are probably familiar with the S10 respirator which was introduced in 1986 as a replacement for the British S6. 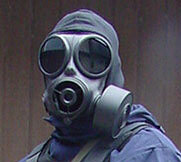 The Avon S10 respirator was designed as a general service respirator to meet British and NATO requirements, and in its SF10 variant is instantly recognizable in the more recent images of Britain's SAS CRW unit with it's distinctive and somewhat indimidating round bug-eyed lenses with tinted outserts (the SAS troops wore the S6 at the Iranian Embassy Seige in 1980). The current NIOSH (National Institute for Occupational Safety & Health) CBRN (Chemical, Biological, Radiological and Nuclear) certified FM12 respirator is a derivative of the S10 mask, but without the facepiece rib interface for NBC hoods and with smaller eye lenses. The next generation of respirators that Avon has introduced are the 50-series masks which are manufactured in the Cadillac, Michigan facility: the C50, M50 and M53. These have a single visor design instead of the separate eye lenses on the S10, for improved field of vision. While similar in appearance, each of the masks has some unique features. I won't be covering the M50 here, but it was developed for the US Government to meet the requirements of the Joint Service General Purpose Mask (JSGPM) program and is being fielded with all four services (Army, Navy, Air Force and Marines) as well as the U.S. Coast Guard. One of the M50's more unique features is the twin-filter conformal system which is not compatible with any other NATO system. Lightweight with slim profile - ensures that the mask is comfortable over long periods in the field. The face mask is available in 3 sizes to fit most facial shapes - the size is molded into the facepiece of the mask above the visor. The facemask is made of a chloro-butyl/silicone rubber blend which provides excellent protection and is softer for a better face seal. Unique visor design - the one-piece polyurethane visor provides excellent field of vision, and is impact and scratch resistant. The visor is optically correct across the whole field of view. Protective outserts are available. The material is impermeable to all chemical agents in liquid, vapour ir aerosol form for over 24 hours. Fog-free due to an internal air flow management system. Filter canister are side mounted on the left or right. Wide range of filters available. High flow fail safe drinking device allows connection to a canteen or hydration system. Front mounted exhale valve for clearer direct comunication. Extended chin flap to compatability with NBC suits and hoods. An optional VPU (Voice Projection Unit) with internal microphone is available, or additional external communication systems can be attached via the ECP (External Communications Port). Industry certified to NATO standard protection factors and CE certified by TNO Netherlands as a CBRN full face mask. The C50 shown here is the size medium, which provided me with a perfect fit and seal. The C50 is available in different faceplate variants - either with single or twin filter ports. The model shown here has the twin filter ports. I'm left handed, so the ability to mounting the filter/canister on either side is an essential feature to me. A filter mount plug is installed on the side that is not being used, and can only be removed and replaced with a small tool. Dual filters can also be used with this variant. The C50 has an elastic mesh head harness which is breathable and more comfortable than the earlier rubber harness of the S10. The brow and temple straps are meant to be pre-adjusted to the user during fitting, then left alone. The brow straps don't have buckles, but have velcro tabs that attach to pockets on the mesh head harness for a flat profile on top of the head. The length of the brow straps are adjusted so that the temple and cheek straps do not touch the ears. The C50 is stored leaving the cheek straps loose. Standard procedure for donning the C50 should be followed (or refer to the user's manual). In a nutshell, the mask is raised to the face and the the chin placed firmly in the chin cup. The head harness tab at the back of the head harness is grabbed and the head harness pulled over and to the back of the head. The cheek straps are tightened one at a time, while ensuring that they lay flat against the head. The face seal is check by placing the hand over the filter inlet port and breathing in, making sure the mask assembly collapses against the race and remain so while the breath is held. At the front of the mask is the valve cassette assembly cover, which can be removed to expose the front exhanle valve. It has a small flip-down door that exposes the ECP (External Communications Port). This is a 3-prong socket that connects internally to a corresponding socket on the inside of the nosecup. A internal microphone can be plugged into the socket, and then a Voice Projection Unit (external speaker) hooked up to the mask, or radio with proper adapter. The drinking tube stores around the valve cover in a recess, with the coupler stowing in the small hole at the bottom of the mask. The drinking tube lever is rotated to open the drink valve and rotates the internal drinking tube/mouthpiece into position for drinking. The mouthpiece can be trimmed in length to suit the user. Note that in the photos below on the left, the mask is being worn over a balaclava only to provide the necessary contrast to illustrate the head harness. I have black hair and the harness blends in with it. Normally, you would not wear the mask over any head garment - the mask will not seal properly to the face. Designed using the latest digital design techniques and manufactured with Avon's newest rubber compounds. A new in-turned faceseal in 4 sizes to provide the best fit, protection and comfort. Same flexible visor as on the C50 and M50, which provides ballistic protection and excellent field of view. Harness and buckles designed to integrate with combat helmets and communication headsets. Fail-safe drinking facility compatible with coventional canteens (with adapter cap) and other types of drinking systems. General purpose (CBRN and CW) and low profile particulate (CS and CN) filters available with unique close-fitting profile. Patented exhalation unit providing the capability to use the M53 with a variety of Personal Protective Equipment (PPE) without the need to remove or change components on the standard M53. It will function as a negative pressure mask using NATO thread filters, an SCBA (Self Contained Breathing Apparatus), PAPR (Powered Air Purifying Respirator) and CCBA (Closed Circuit Breathing Apparatus). NBC hood - a fully integrated specially designed lightwiehgt NBC hood is manufactured in 4 sizes that provides full head and neck protection. It can be attached to the mask and stored in the carrier. Optional Voice Projection Unit (VPU) and communications - The VPU attaches to the front of the mask and is connected to an internal microphone through a fully sealed connection plug. It can also be used to other communication devices. The first thing that came to mind when I handled the M53 was 'wow, I can actually get a decent cheek weld when using a rifle with this thing'. Why I got excited about that, I don't know, since the chances are almost nil that I'd ever need to, being a civvie and all, but I was thrilled all the same. The M53 is tailored to the shooter as it comes in left or right side filter mounts, right or left handed shooters, and the opposite side is a blank, flat and flexible area which allows the shooter to acquire weapon sights without much change from the normal cheek weld. Shown here is the right-side filter mount, set up for a lefty shooter like me. The front view photos of the M53 show how close to the cheek the mask is, on the left side. When placing the cheek against a rifle stock, the soft side of the mask flexes inwards without compromising the seal around the face. No other mask I've tried allows me to do that. The C50's cheek weld isn't bad due to its low profile, and will flex inwards, but the unused plastic filter mount will still knock against and slide on the rifle stock and can get a bit annoying. The M53 takes any NATO 40mm thread filters, and also has its own low profile-design filters. The head harness is of the same configuration as on the C50, with the exception of the cheek and temple buckles, which are metal instead of plastic. The M53 and C50 share the same visor. I've illustrated the flexiiblity of the visor in the photograph above on the far right. I've folded the mask in two by squeezing the visor so that the inside surfaces on each half of the visor are actually touching. It's pretty impressive stuff. The VPU (Voice Projection Unit) for the M53 is powered by a single CR123 battery. The VPU attaches to the front of the mask's valve cassette assembly, and can be removed and re-attached in about a second. The 3-pin lead (cable) is then plugged into the communications port at the bottom of the mask. The M53 VPU plug also has a two-hole jack for external communications, like a radio. Inside the mask is a communications port, into which the microphone(s) is plugged into. Either a single or dual microphone setup (dual mic shown here) can be used - one for the VPU and another for the radio. The VPU has a switch on the front which is rotated counter-clockwise to turn it on. When using it, the voice is transmitted very clearly at a 83db level and can easily be understood. The M53 has an external drink tube which stows around the outside of the valve cassette assembly, and works just like the one of the C50. The front of the mask is referred to as the VREU (Variable Resistance Exhalation Unit), and houses the valve cassette assembly. To switch between negative pressure mode (normal mode for use with filter cannisters) and positive pressure mode, the valve cassette assembly is turned to the horizontal position, which increases the exhalation resistance. This provides greater positive pressure and additional protection when using a PAPR (Powered Air Purifying Respirator) or SCBA (Self Contained Breathing Apparatus). In both cases, the hoses are attached to the filter port, and a filter cannister is not used. For CCBA (Closed Circuit Breathing Apparatus) use, the valve cassette assembly is turned to the vertical position and the CCBA adapter connected directly to the VREU. The clean air hose is then connected to the filter mount. The circuit is complete when the exhalation hose of the CCBA is connected to the CCBA adapter. The VPU cannot be used in the CCBA mode. General Impressions - Both the C50 and M53 are very comfortable on the face (as far as gas masks go) - they conform to my face shape for a secure seal, and the mesh head harness distributes the weight well. I found them more comfortable than the Scott M95, which has an uncomfortable chin cup (for me). Both masks have an excellent internal air flow management system. The air entering the mask through the filter port hits an air deflector which directs the flow along the inside of the visor. This prevents any fogging of the mask, as well as the prescription lenses if used. I can feel the airflow in front of my eyes when taking a breath. Exhaled breath is contained within the nose cup and expelled through the front exhale valve. Inhalation resistance depends on the filter used and how long the filter has been used and exposed to dust, particles etc. The close contour brow of the C50 and M53 allows a helmet to be seated properly when worn with the masks. With the S10, I found that the top of the big round lenses prevented the helmet from being seated fully in front, and the helmet would have to be tilted back slightly. As you can see in the photos above, the C50 and M53 are both fully compatible with the Gentex TBH and Ops-Core helmet harness with gas mask extender. As mentioned above, the M53 allows sights to be used when mounting a rifle with a cheek weld that's pretty close to normal. Only a slight cant of the weapon or head was necessary to sight through an Aimpoint red dot sight. The soft rubber of the M53 cheek provides a non-slip weld to the rifle stock. Field of vision through the one-piece visor is excellent; without the sometimes distracting division between the eyes that dual lens systems have. The single visor also makes the mask feel less 'enclosed' or claustrophobic - less so than the S10 or M95 that I have. Accessories - Some of the available accessories for the C50 and M53 are shown below. Avon makes a replacement canteen cap that adapts any USGI canteen for use with the Avon drink coupler. Like the visor, the outserts resilient and flexible, and provide protection from the main visor from scratches. They are easily switched out. There are outsert receptacle sockets on either side of the visor. The outsert locking tabs are simply inserted into the sockets. Outserts are available in Clear (purely as additional protection for the visor under extreme conditions), Tinted/Smoke (sunlight protection and glare), Laser (a green lens, mostly for protection against IR lasers in the battlefield environment) and an Orange Blue Blocker outsert (reduces glare and improves contrast under overcast conditions). The sight correction system consists of a prescription lens insert for which the Rx lenses are installed, and a mounting frame. The lens insert can be adjusted in height by sliding and locking it in position on the mounting frame adjusting column. Mounting frame tabs on each side fit into sockets on either side of the mask's visor. The Rx lens size is large enough to provide good field of vision for users. On the Scott M95, the Rx inserts are too small. Filter cannisters - Avon makes a variety of filters to fit most user needs. The M53 accepts any NATO 40mm thread filters as well as it's own low profile filters. The M53 filters have a dished (concave) interface which place them closer to the mask. Shown here are the M53 Multi-purpose CBRN filter and the lower profile Particulate filter. The C50 accepts any NATO 40mm thread filter. Shown below are the CTF12 Riot Agents filter and the CBRNF12 NIOSH filter. Visit Avon's filter selection guide for more information and specs. M53 Carrier - The M53 storage bag/mask carrier comes in foliage green and is designed to carry the M53 with protective hood attached. It's made out of 1000D Cordura and has waist/shoulder and thigh straps. It opens from the front via the velcro flap, and has a storm collar on the inside. There's a compartment on the outside for the operator reference cards and also the supplied waterproof bag for protecting the mask if submerged. The same compartment houses a fold-out MOLLE panel that is used to attach the bag to a MOLLE platform or belt. Another outside compartment carries spare outserts. M53 Protective Hood - The M53 NBC protective hood is made out of GORE™ CHEMPAK® Ultra Barrier fabric, which the premier non-permeable chemical barrier product on the market. It's completely seam sealed, and covers the head and neck for additional protection against vapours, liquids, aerosols and particulates for 24+ hours. The material is also flame-resistant. The hood is attached to a rubber 'second skin' which covers the exposed rubber of the M53, prolonging its service life by protecting it against harsh chemical environments. The openings fit and seal around the mask exactly. Two straps run under the arms to secure the hood to the shoulders. The VPU and filter must be removed to attach the hood to the mask. 9/12/08 - Originally designed for ice climbers and telemark skiers, the Arc'Teryx Military Knee Caps are now available in a tactical black/grey-green colour from the Arc'Teryx LEAF division. At only 5.4oz a pair, there are possibly the lightest hard-shell tactical knee caps/pads on the market. They provide low profile protection for the patella that can be worn over or under a set of trousers. Description - The Arc'Teryx Military Kneecaps feature a thin but tough, anatomically-shaped Kydex® hard shell laminated to EV®50Evazote foam, made in Great Britain by Zotefoam. The portion of the hard shell that protects the kneecap is thicker and stiffer than the narrow, flexible section below the kneecap. There is no lip or protrusion around the hard shell to snag or catch on things. The foam is about .35" thick. The Kneecaps are held onto the leg by two 1" straps. The upper strap is elastic, allowing the top of the Kneecap to move on the knee while bending it, and the lower strap is thin webbing, which doesn't stretch and prevents the Kneecap from slinding down the calves. Both are secured and adjusted with low profile cam-lock buckles. The Arc'Teryx Kneecaps were designed with agility and breathability in mind; during training or operational use where mobility outweighs the need for heavier protection (like riot control or urban assaults). They offer no ballistic protection. They're also available in all black. Observations and usage - The light weight of these Kneecaps are immediately noticeable when compared to other knee pads. Also apparent is their low profile. The hard shell material provides a non-slip surface and the shape conforms to the knee quite well. The Kneecaps measure about 9" tall x 7.5" at their widest point. While they're low profile enough to wear under a set of trousers, I wouldn't go so far as to say that they're so comfortable you'll forget they're on. Personally, I don't like the feeling of webbing or elastic against my bare skin and prefer to wear them outside the pants, or at least over a thin base layer if worn under the pants if it's cold enough to do so. I also found that the Arc'Teryx Kneecaps will fit inside the knee pad pockets of some pants, as they're the same size as the 5.11 knee inserts that I have. I just made sure that the straps weren't twisted inside the pad pocket and that the camlock buckles were off to the side. They worked much better than the 5.11 knee inserts. The one small issue that I had was that the camlock on the elastic strap isn't as secure as I'd like, and popped open once. The camlock locks down properly; it's just that pulling or catching the end of the elastic while brushing up against something might cause the camlock to open. I solved the issue by slipping an elastic loop over the elastic strap and covering the camlock after locking it down. Just for the sake of comparison, I put an Alta Superflex knee pad on one knee and the Arc'teryx Kneecap on the other. The Arc'teryx Kneecaps are lighter and less bulky, but also absorb very slightly less impact when I dropped to both knees on a hard surface. Even so, they are more than adequate for most impacts you'd experience when taking a knee or going prone. They also give up a bit of side coverage for the low profile and bulk. I also found that the 1" straps were more comfortable than the wider ones when the knees are bent. If light weight and low profile are what you're looking for in a set of knee pads, the Arc'teryx Military Kneecaps would be it. 9/29/11 - The excellent Arc'teryx Military Knee Caps are now available in Crocodile and Coyote (besides Black and Foliage Green). Besides the new colour offerings, they now have easier to use and adjust T-lock quick release triglide buckles. The new Arc'teryx Military Knee Caps are made of the same material as the older ones - anatomically-shaped Kydex® hard shell laminated to EV®50 Evazote foam. The black and foliage green still have the black hard shell on grey-faced foam - the only difference between them being the colour of the straps. The new crocodile and coyote knee caps have crocodile and coyote hard shells laminated to black-faced foam, and matching straps. I'd also have used the grey-faced foam for the new colours as it presents less contrast than the black foam, so I'm curious as to why they didn't do that. Like the previous model, the top strap is elastic while the bottom strap is not - it's webbing. The bottom webbing is now heavier, and more grippy. The previous one was a bit thin, and the camlock buckle didn't have much bite and was prone to popping open. Instead of the camlock buckles, the new knee caps have T-lock quick release buckles in matte finish, which make the donning and doffing of the knee caps much easier and convenient. The length of the straps can be pre-adjusted and the knee caps removed without having to thread the straps through camlocks and re-adjust. I added my own elastic webbing keepers to secure the loose ends, something that'd be 'nice to have', but not absolutely necessary. As mentioned in the previous writeup, the Knee Caps are low profile and very light weight; and can be used outside the pants, or in some cases, in knee pad pockets. Arc'teryx has been designing their knee pad pockets on some pants like the Sphinx and Gryphon pants to fit the Knee Caps specifically, with slots for the straps pass through. The new Talos pants are also designed to be Knee Cap compatible. 12/27/06 - Alta Industries's knee pads are now available in Crye MultiCam, exclusively from SKD Tactical. The problem I've had with similar designs is that they don't stay put, always making their way down my legs, necessitating the tightening of the elastic straps. The Superflex knees pads, on the other hand, don't have two elastic straps like the other similar-looking brands; the bottom strap is non-elastic webbing. Whoever came up with that simple solution deserves a medal. By having a non-elastic strap at the bottom, below the knee, it prevents the knee pad from slipping down the calf. It's also more comfortable than a tight elastic strap. Crye MultiCam cordura is used in the construction of the pads. The AltaLok buckles make for quick donning and doffing, and do away with velcro, which I disliked on knee pad straps. The buckle is simply slipped over the metal stud on the side of the padding, and it stays put. There's no left or right knee pad; they're both identical. Alta saves manufacturing costs and it doesn't affect function. The rubber pad provides protection for the knee cap and a non-slip surface. The inside of the pad has a soft fabric lining for comfort. There's no provision for securing the loose ends of the straps, but that was solved by folding them over and tucking them in, as shown below. I like them - they're swaying me back from the KPs. If you want pads to match your MultiCam uniform, they're the ticket. 11/27/05 - KP Industries's knee pads are familiar to those in the construction industry. KP now offers 'Tactical' versions of their knee protectors, which are essentially the same as the civilian ones, but molded in more 'suitable' colours (black, OD green and tan), and available from i-SHOT Shooting Sports. I've used Hatch and Point Blank knee or elbow pads in the past (the Hatch elastic straps degraded after a short time), and they all had one thing in common: they weren't very good at staying put. Most of the knee (or elbow pads) out there are essentially one-piece types, with two elastic straps holding the pads in place. However, I've never been completely satisfied with them, as the knee pads slip down, off the knee, or the elbow pads don't stay centered on my elbow. The KP Tactical Ultra Flex II knee protection shown here solve the problem of securing a single pad to a pivoting joint by making it a two-piece assembly instead, and making them pivot, just as the knee does. Upper and lower hard plastic shells are joined together by a hinge, which allow the pad to follow the leg as it bends. One set of straps secures the upper shell to the thigh, the lower strap just above the calf. The lower shell has a non-slip rubber pad on the front. The elastic straps have quick-release buckles. The lower shells are lined with closed cell foam. The Armor-Pro Tactical Elbow Pad doesn't have the hard plastic shells that the knee pads do, but have a flexible rubber body which bends with the arm. There are two securing straps, one that goes around the bicep and the other, the forearm. A dense foam cup cushions the elbow, while the rubber body protects the forearm. The colour of the pads was a light tan - I'd have preferred slightly darker shade like khaki, so I decided to give them a light coat of paint. I don't know why I thought at that time the paint would stay, but it didn't of course, and wore off the moment I hit the dirt. So don't bother painting them and wasting your time like I did. A 'nice to have' would be matching coloured hardware and elastic straps. I took them out shooting in the desert, and went through a bunch of intermediate carbine drills (double kneeling, kneeling, squatting etc). I'd drop quickly to my knee from the standing position and the knee pads cushioned my knees nicely. When going into the prone position, the elbow pads were very comfortable to shoot with and having the extra forarm protection was a boon. The KP pads are not immune to shifting, as they will move with the clothing as it moves on your body, so I'd make the occasional adjustment. But I had to adjust them far less often than the single-piece types. There is also less 'binding' and restriction when the knee or elbow is bent. Armour Technologies Corp Level IIIA ballistic vest made out of Spectra Shield. Worn under load bearing vests. Front chest pocket has blunt trauma plate. Scott M95 (L) and Avon S10(R) gas masks without filter attached. The M95 has good field of vision, even downwards. Both will accept prescription lens inserts. Side views showing the filter connections. Both have 40mm filter connections and take EN, USA/NIOSH, NATO type thread canisters. The filter cannot be switched over to the right side on this version of the S10 - on others it can. Back views: the M95 has a more comfortable strap system. The S10 rubber might pull at your hair slightly. Even though the S10 looks really cool (ala SAS), the M95 is more comfy on my face.